NBC 5 viewer Mitt McGuire snapped this photo on Christmas morning of an unusual cloud over North Texas. 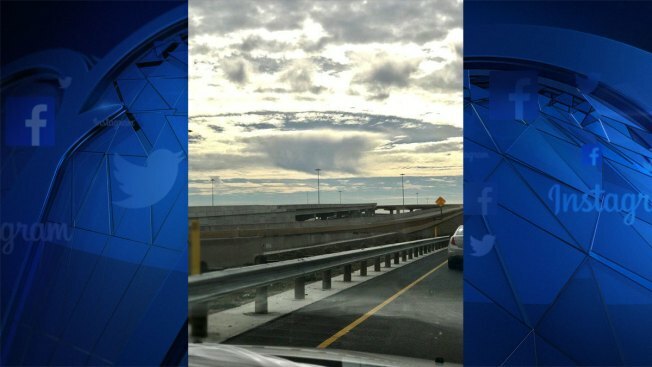 This is what we call a hole-punch cloud, or alternatively, a fallstreak hole. These unusual clouds form when an aircraft flies through a layer of supercooled water droplets in a deck of altocumulus clouds, Monday December 25, 2017. NBC 5 viewer Mitt McGuire snapped this photo on Christmas morning of an unusual cloud over North Texas. This is what we call a hole-punch cloud, or alternatively, a fallstreak hole. These unusual clouds form when an aircraft flies through a layer of supercooled water droplets in a deck of altocumulus clouds. The same lift from the airplane's wings that allows it to fly, also lifts the water droplets. Lifting cools the droplets into ice crystals, that then fall out of the cloud deck as light snow. So yes, there was a White Christmas in the air over the DFW Metroplex Monday morning. But these snow crystals are too small, and the air near the ground too dry, for them to survive all the way to the surface. So there was no snow at ground level, but you could certainly see it in the air overhead if you were in the right place this morning. As the snow crystals fall out of the cloud, it leaves a hole in the cloud layer. Click here for more photos of hole-punch clouds and details on how they form.